A ceremony remembering the 17th anniversary of the 9/11 terrorist attacks will be held at Sussex County Community College (SCCC) in Newton on Tuesday September 11th at 9 am at the College’s 9/11 Memorial on the Connor Green. A ceremony remembering the 17th anniversary of the 9/11 terrorist attacks will be held at Sussex County Community College (SCCC) in Newton on Tuesday September 11th at 9 am at the College's 9/11 Memorial on the Connor Green. Residents and college students are invited to attend the annual ceremony where each year we join with hundreds of other communities across America in remembrance and prayer. We will gather and reflect upon the innocent lives of those that were killed; we will pay solemn tribute to those that heroically sacrificed their own lives to save thousands of others; and, we'll remember all those that helped in the rescue-recovery efforts that followed at Ground Zero. The Sheriff's Honor Guard will be on hand to present the colors and the Newton VFW Post #5360 will perform a 21-gun salute. Local Police, Fire and EMS Departments will lay wreaths at the base of the memorial during the ceremony. Local vocalists and bagpipers will also bring their talents to the remembrance ceremony. 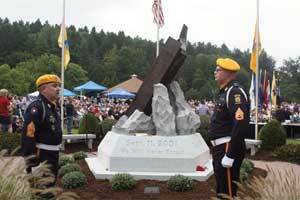 The 911 Remembrance Ceremony is an annual event organized at SCCC by members of the Sussex County PBA Local #138. For more information on the ceremony, please contact Ptl. Mahir Kaylani [ mkaylani@newtonpolice.org ] or Ptl. Ed Sperling at the Newton Police Dept. (973)383-2525.